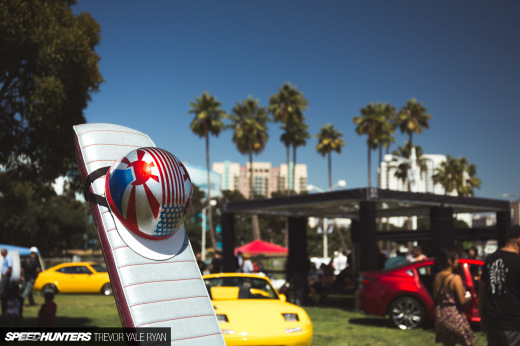 As I walked through the field of Japanese classic cars at this month’s event in Irvine, a certain car sparked my attention, sitting way in the back, next to the Toyota Motorsports big rig truck. 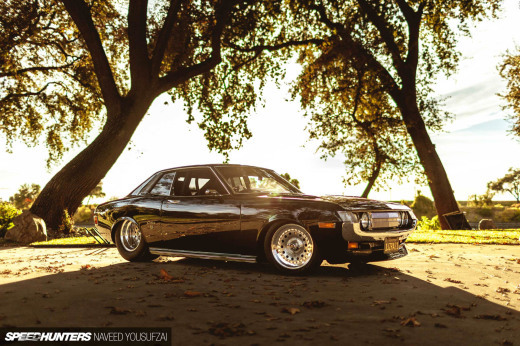 The car was an ST162 Toyota Celica; it was the coupe version of Toyota’s first front-wheel-drive Celica. This ST162 chassis of Celica was sold in the USA from 1986 to 1989, with three different normal trim levels: ST, GT, and GT-S. (In other countries, they also released other versions, like the GTR, which had 4W steering) For the 1988 and 1989 model years, Toyota also released a completely different type of Celica which shared the same base chassis, but with big improvements – the ST165 Celica Alltrac Turbo, which was known in other countries as the GT-Four (droooooooooooooooool!!!). The ST165 Celica GT-Four was made only in hatchback/3-door format, not a 2-door coupe, like the Celica shown above. 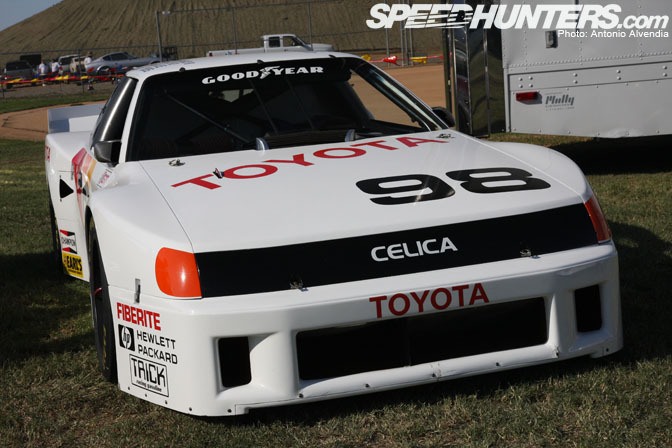 Back to the subject – the Celica shown above is actually a fully developed race car, which has the body of a ST162 Celica. The car was developed by Dan Gurney’s All American Racers, a legendary racing team based in Santa Ana, CA. It amazes me to think that a company with a worldwide motorsports presence like AAR, the only race car builder from the USA to build a winning F1 car and a winning Indy 500 car, is based right in Southern California’s Orange County, near places that I hang out frequently. 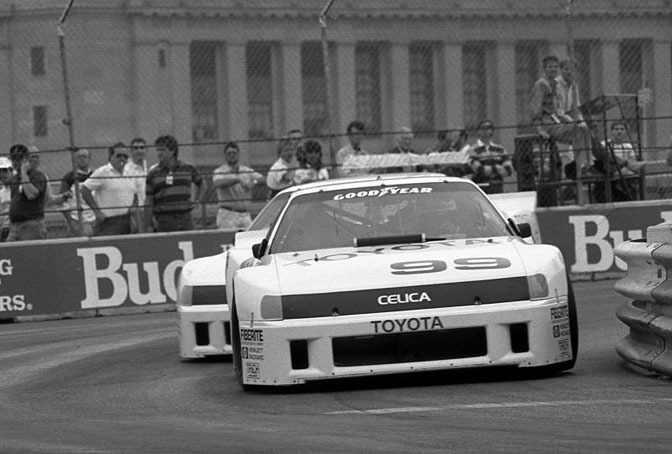 The Celica above was one of two Celica race cars built as high tech competitors in the Manufacturer’s Championship for the 1987 IMSA season‘s hotly contested GTO class. These cars were the result of a collaboration between Indy Car designer Roman Slobodinsky and the famed All American Racers team, whose racing roots go back to 1965, when Dan Gurney officially teamed up with Carroll Shelby to create AAR, with the help of Goodyear Tire Company. These AAR Celica GTOs had Toyota production based, turbocharged 4 cylinder engines with a displacement of only 2090cc (128 cubic inches), but they had to compete against cars with engines rangine in size from 300 to 360 cubic inches. 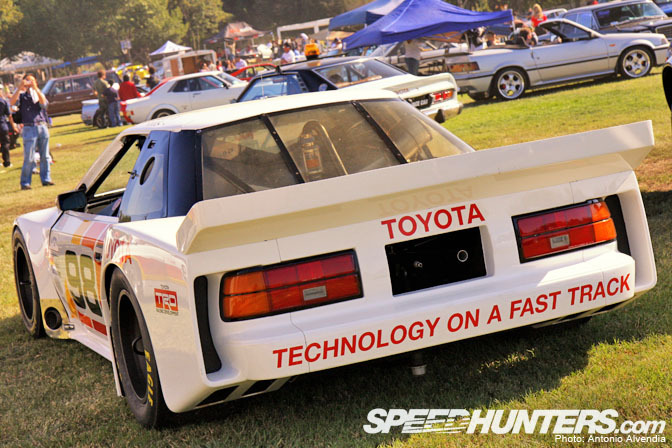 Even though the Toyota engine produced a lot less horsepower (450hp at 8000rpm) when compared to their big, 600 hp V8 competition, the Celica’s excellent downforce, high speed stability and advanced construction technology gave the V8 guys a run for their money. Let’s take a look inside the cockpit – you can easily see the hand fabricated mild steel tubing that was used throughout the car for the rollcage and frame, See that huge transmission tunnel? Are you wondering why a FRONT WHEEL DRIVE car such as a ST162 Celica would have such a big transmission tunnel like that? Well, that’s because the FF Celica was actually converted to FR; yup, front engine, rear wheel drive. 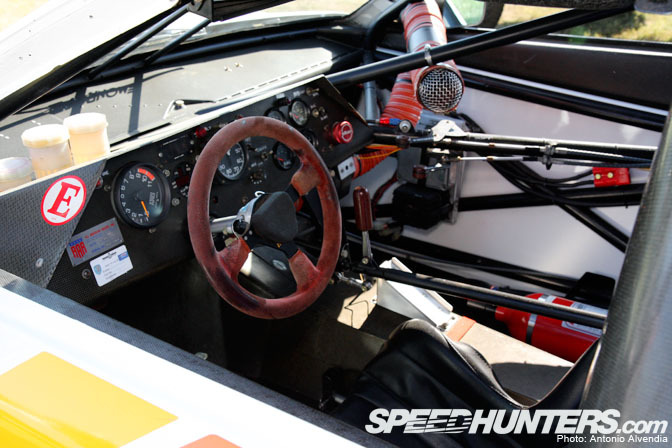 I think the interior of this 1987-era race car is very interesting! Note the usage of the red (now faded) suede steering wheel, carbon fiber dashboard, and the combination of fiberglass and aluminum body panels – even back then, AAR was using construction technology that modern day race cars still use today, some 21 years later. See that big round mesh thing inside that looks like a huge microphone? I’m sure the AAR drivers weren’t practicing their freestyle rhyme skills while driving; I was told that’s actually an air filter. My favorite part of the interior is the gauges – old school Nippondenso/TRD tachometer, oil pressure, oil temp, and water temp gauges. I have a set of these rare and expensive gauges for the AE86 track project I’ve been slowly building – I just hope the finished product of my hard work comes out as cool as the gauge display of this Celica GTO. I’m sure you all can’t take your eyes off the huge box flares used on the rear of this car – I can’t blame you! They make the car look wider and meaner for sure! This is an example of AAR’s advanced aero technology used in the IMSA GTO class – the rear bodywork has ducts behind the wheels and under the bumper to channel the air to achieve maximum flow and efficiency. The big ducktail wing affixed to the rear trunk area definitely provides downforce, especially with the upturned flaps on the corners of the wing. Celica afficionados will also recognize the kouki (late model) coupe taillights used on the back of this car. Perhaps a minor change to make the car look as current as possible, even though the car was built when the production cars were still using the zenki (early model) taillights, which look alot better in my opinion. 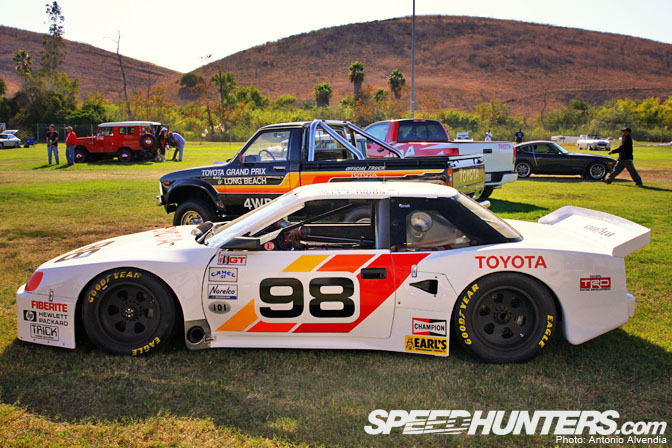 Wow, just look at this Celica’s aggressive stance – it is a race car, so of course it’s super low! However, look at the other details – the side exit exhaust right behind the front tires, and the air intake vents on the front of the rear fender which takes the air and channels it smoothly through the fender work, and back out the rear of the car. Also notice the usage of single center lug wheels – AAR obviously didn’t want to waste any time changing tires at race events! Looks kind of Nascar style when you look at it, don’t you think? However, I was surprised myself to find that these wheels are actually made by Momo (16x12F and 16×12.5R), and are wrapped in Goodyear Racing slicks of course, since Goodyear was the original financial backer of AAR in the 1960s. Here’s another view of the cockpit, but this time, from the opposite window. That old school bucket seat doesn’t look comfortable at all! Old school dry carbon aero mirrors were only used as high end racing items back in the day. Now, you find carbon fiber mirrors on all sorts of cheaply made carshow cars all over Southern Cali. Sigh. team captured many class wins, including the GTO Championship (with this ST162 Celica GTO) in 1987. Looks like a scene out of Days of Thunder, but with a Celica leading, doesn’t it? 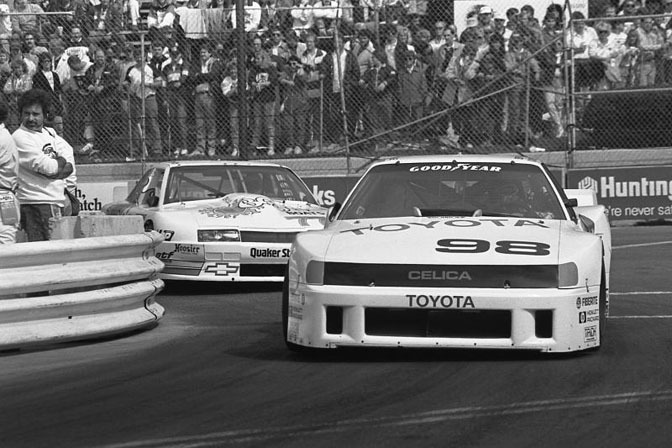 Here’s a cool photo of both AAR Celicas (#98 following #99 closely) negotiating a turn in 1987. They look so cool! Make sure to visit Mark Windecker’s website (link is below) for even more photos from this era. Thank you Mark! This car looks so cool, love the interior as well. I would give my left nut and perhaps a piece of the right just to take this for some runs down the mountain. Is it weird that I would TOTALLY daily that car and love every waking second? it would be nice if you guys wrote an article or two on st165 and st185 celica all tracs! Looks kind of like Nascar style?! Nascar wishes. i believe you Andy. especially after you dropped me off at the airport driving your Formula D competition car. funny how people stared at me all crazy after I crawled out of your caged BMW! lol why would they think that was weird? Must have been your skull helmet. 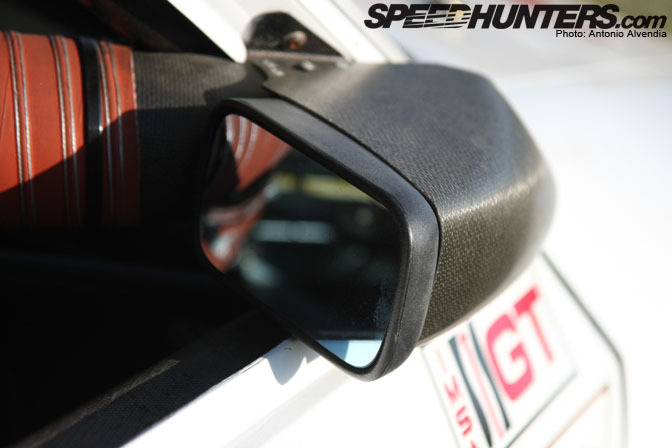 sure i'm down, but you gotta wait a while... even though most speedhunters readers can read our features in like 2 seconds, it takes us a lot longer to put it together! i think we're busting out more stories than most other editorial teams in our genre right now!!! i love ST165 and ST185, so don't worry! If there was a possibility of a radio being put in I would consider daily driving this beast...But I would imagine after the third trip to the gas station in 2 days would have me hankerin' for something else! Nice history lesson and feature.